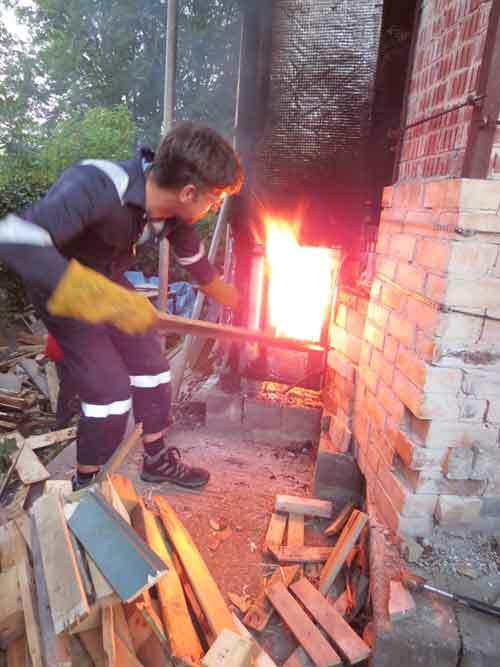 " Woden" - Wood Fired Kiln - The Twentieth Firing! 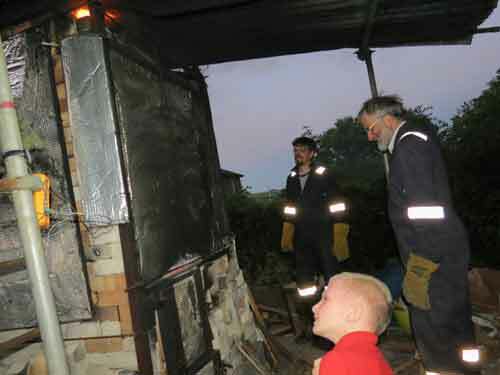 This page records the Twentieth firing of the Woden kiln in June 2017. 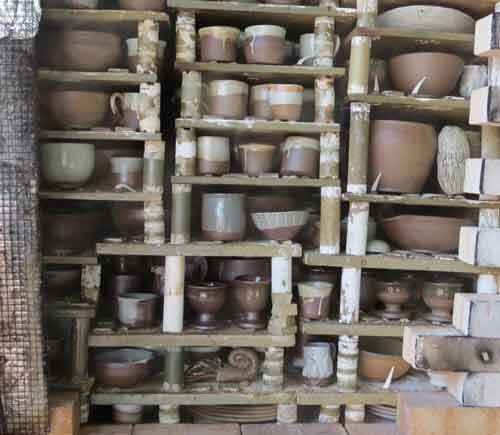 It is an archive of photographs taken before, during and after the firing. 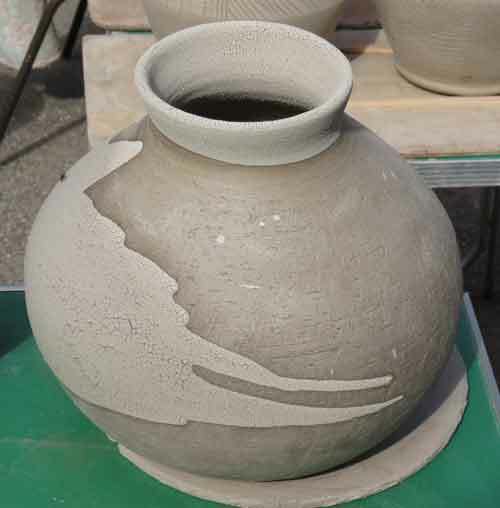 No alterations were made to the kiln before this firing. A better attempt was made at blocking the gap at the top of the bricked-up door where it rested against the fixed brick arch - ceramic fibre was laid along the gap, held down with bricks. So the flames only came out at one end. The weather was bright and sunny with a gentle breeze at times, which picked up in the evening. A high pressure weather system was lurking. 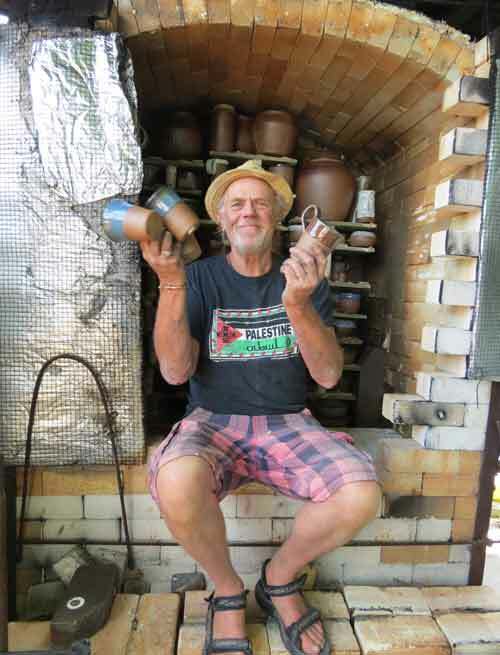 Some of Bill's students' work and Laurence Eastwood's cider jar. 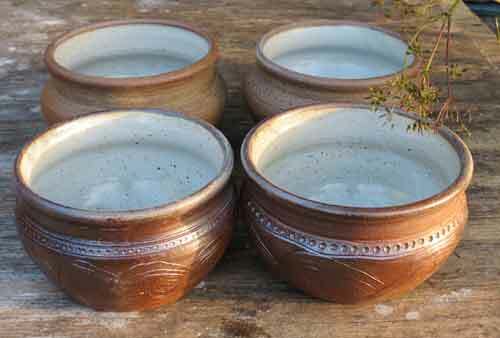 Some of Bill's bowls etc. 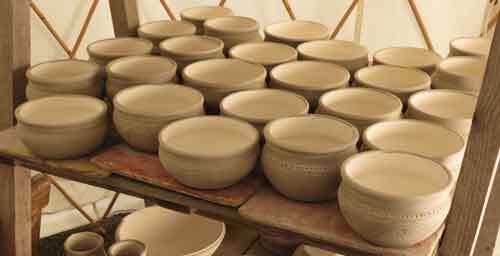 Some of Bill's bowls, glazed with wood ash based glaze, which cracks as it dries, sometimes it stays on, sometimes it falls off - especially on biscuited ware. Any suggestion gratefully received about how to cure that, Bill has tried adding bentonite, washing the ash more, adding Epsom Salts. The recipe also has feldspar soda, ball clay, china clay and the ash - this one from the Long Chritchel bakery oven. 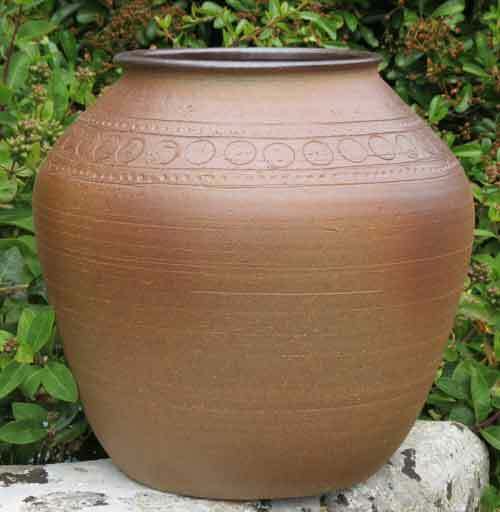 Bill trying to get artistic with a "Moon Jar"
That'll teach him to have artistic delusions! 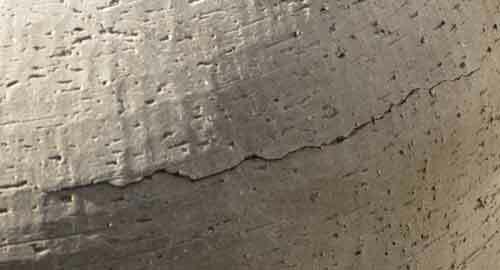 The Moon cracked after the ash glaze was poured into it and over it. Queen scallop seashells, stuffed ready to stand the pots on, to stop them sticking to the kiln shelves. 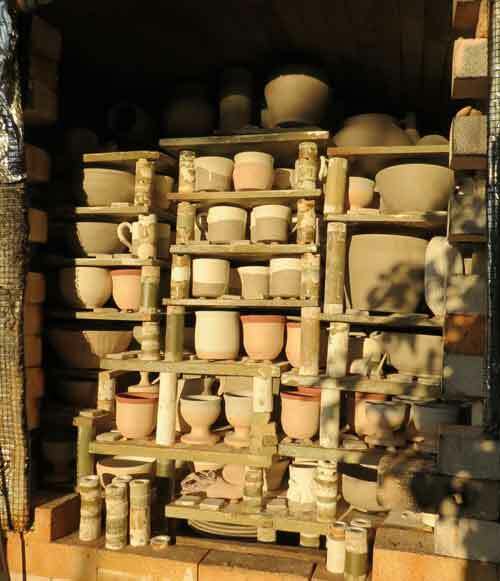 The back section of the kiln loaded. 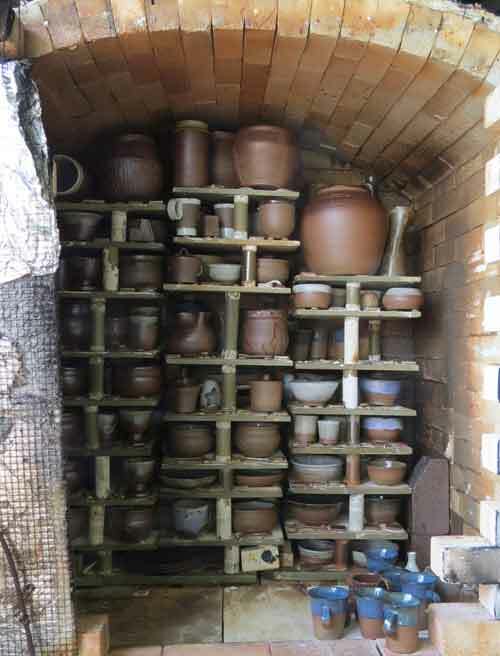 Fairly tightly packed, but with fewer shallow pots than most previous firings. 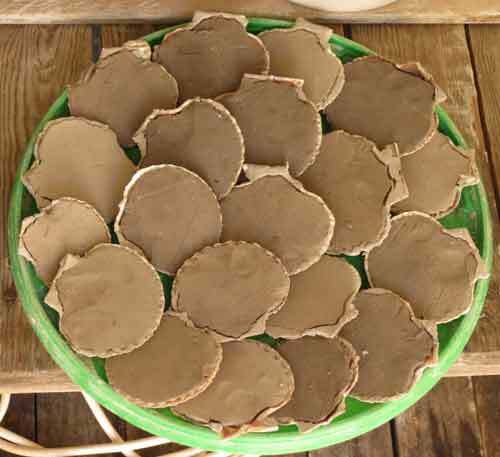 A batch of unglazed plates were stacked in the coolest bottom corners, destined to become pizza and bread cooking platters. Almost fully loaded, in the evening sun. Just a few more to be put in on the morrow. After a night of slow warming and drying out. Started at 6.30pm, stoked overnight with logs from Kate V just about every hour. 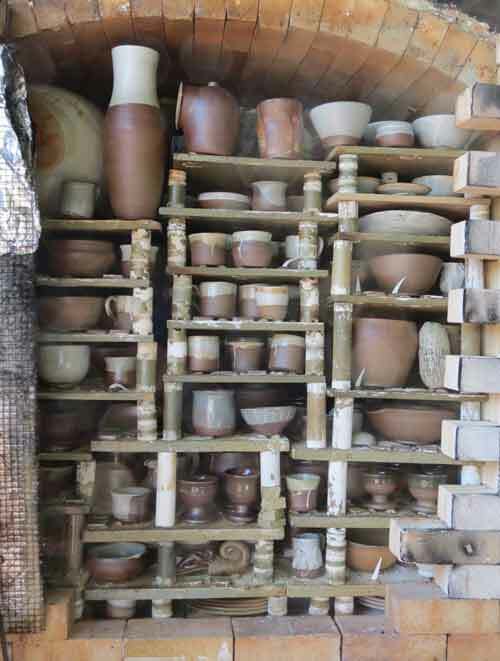 Those logs were replaced from 6am with assorted recycled timber, mainly pallet wood, for the rest of the firing. 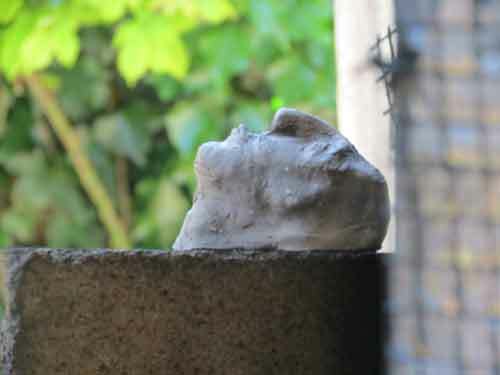 Between morning stoking Steve sculpted one of his death mask style heads and left it to dry on the chimney tunnel. Perhaps keeping an eye on the firing. By 2pm the chamber was glowing at about 650C. 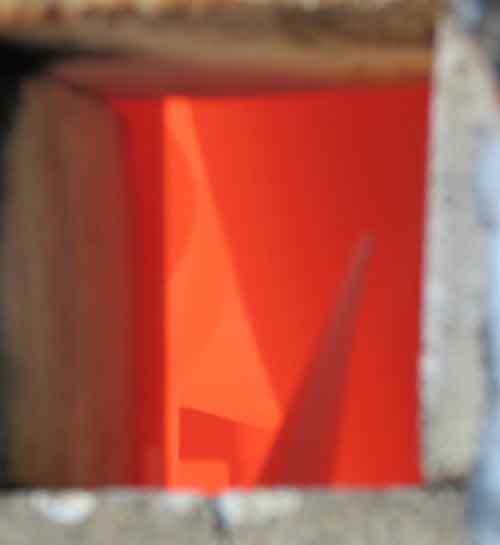 This is the view through the spyhole into the kiln, the pyrometric cone standing proud with shapes of pots behind. The chimney was smoking most of the time, this is at about 3pm. 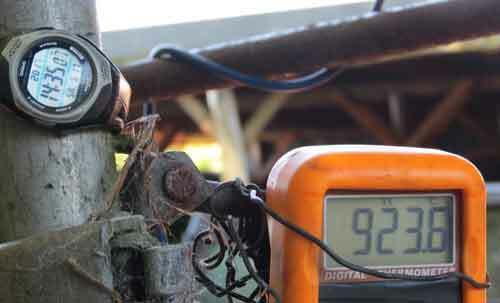 By 14.35hrs the digital read-out for the top thermocouple probe was over 900C - ahead of schedule. Late evening - Steve hard at work stoking, before he went off to feed the dog. 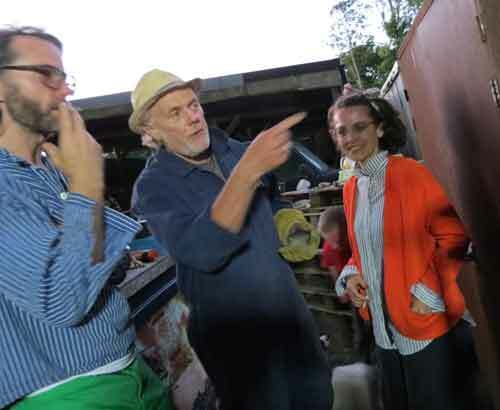 And Richard came to stoking the other firebox for the rest of the session. 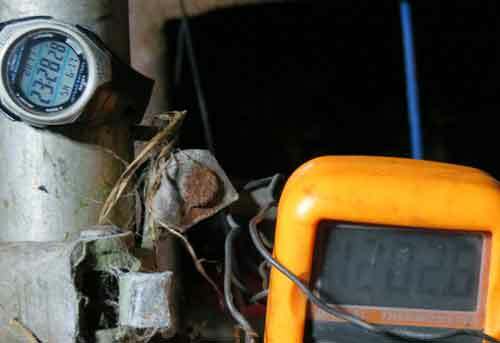 Meanwhile Bill swans around with an IR gun to measure the temperature. 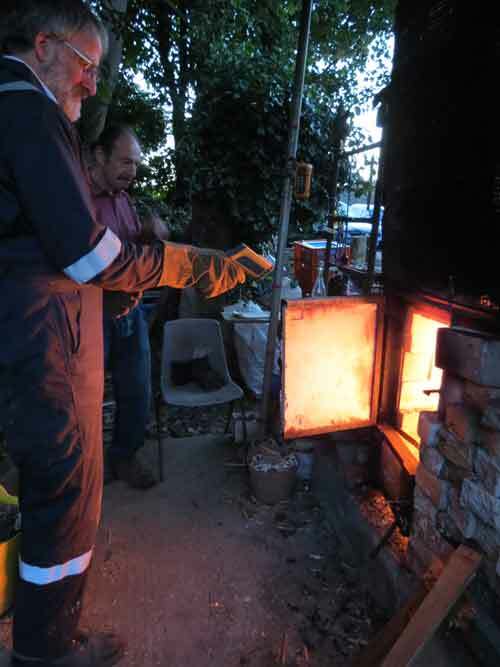 He and Mark also tried heating their bronze in a crucible in the firebox, but it did not reach melting point. So this is what it is all about - Flames! 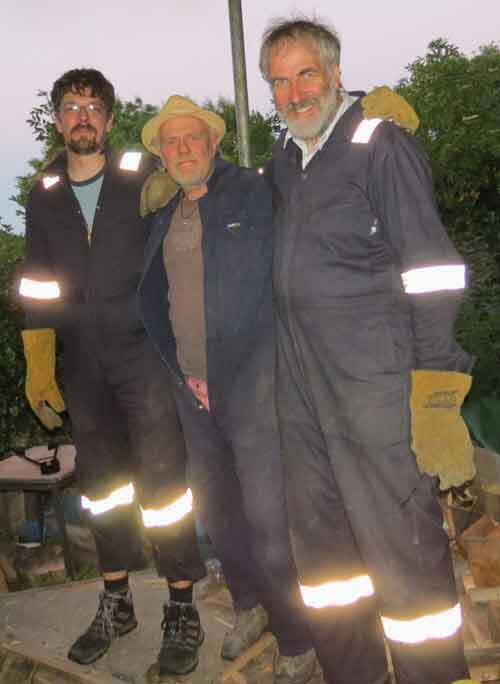 The late shift, is Steve being supported in the middle? The evening was spent watching the digital read-out hovering around 1200C - which because of being out of calibration meant the chamber was about 1240C at the middle. 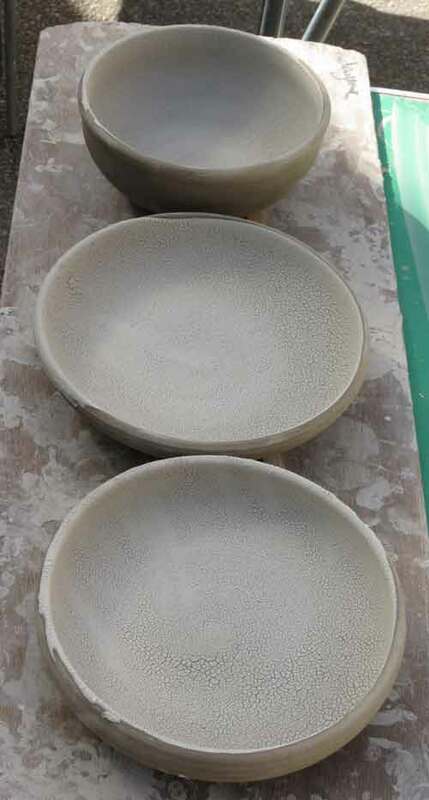 It became very hard to reach the next 20C rise need to mature the glazes, various stoking regimes were tested. The breeze picked up which helped a bit. 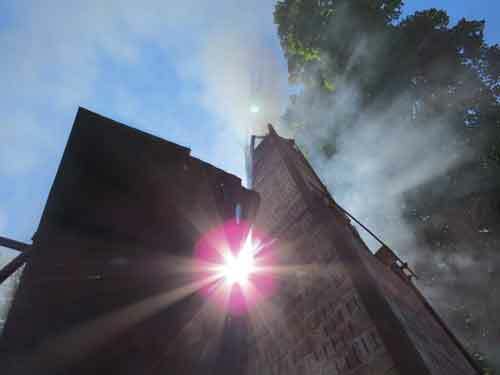 There was a high pressure weather system, which some say stops the chimney pulling so effectively. 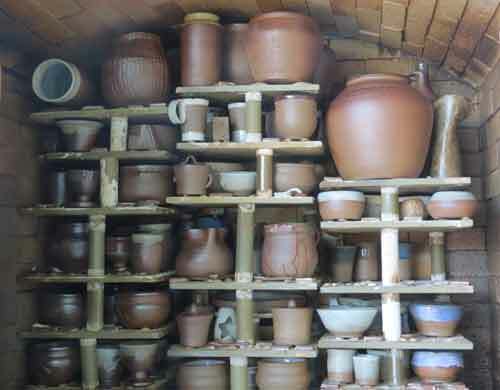 Steve was working towards his "Tour Guide Level 3" certificate, explaining the kiln and firing to the various visitors. 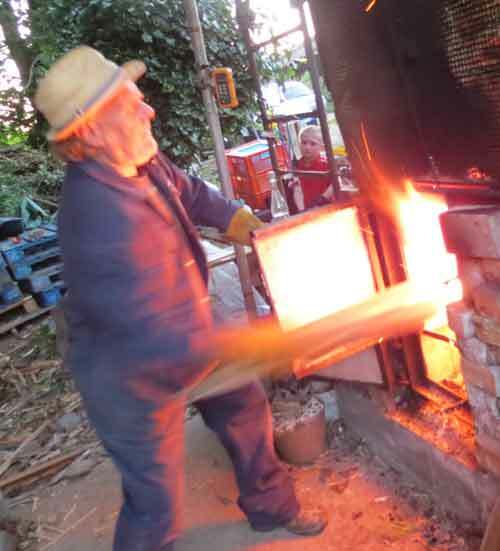 However Bill finally stopped stoking an hour or so later, after closing off one firebox and filling the other fire box with pallet lumps and then letting the kiln cool to about 1100C before blocking that up as well and closing the chimney off. 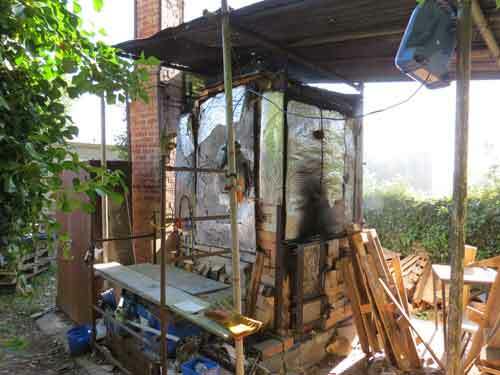 This is the front of the kiln chamber, after the brick door has been taken down. 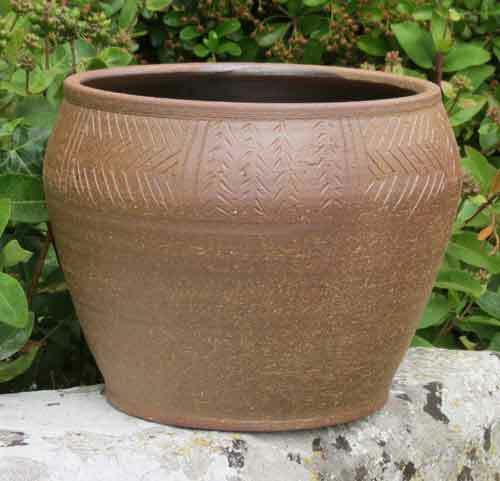 This reveals the state of the fired pots and the amounts of ash deposited on the pots and the amount of reduction experienced. 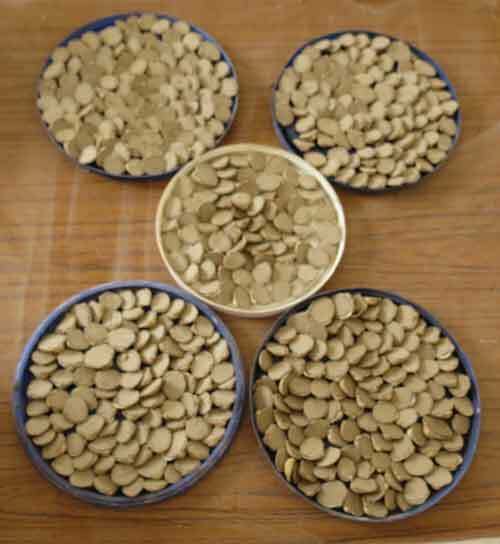 The pyrometric cones can be seen at various stages of collapse, showing the difference in temperatures between the areas of the chamber. 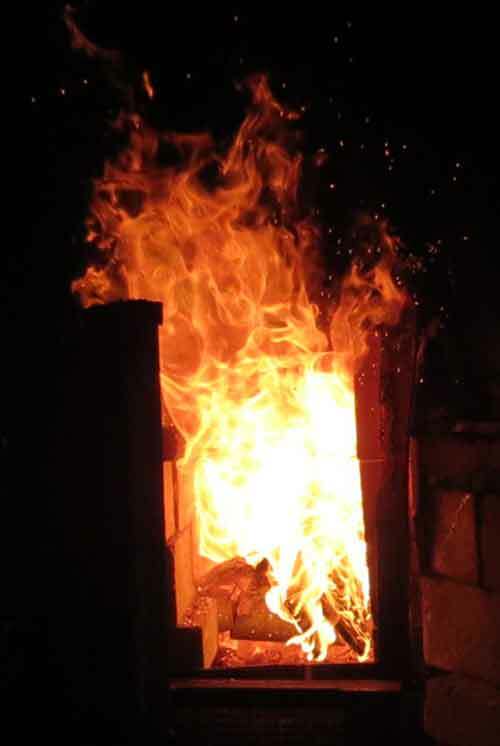 The top of the chamber is hotter, the base is cooler, but the section on the left nearer the entry of the flames is hotter than the right away from the flames. The fears of an underfired effort were unfounded, with most of the glazes matured OK.
A close up of the lower part of the front. The bright sunlight has confused the camera, so the colours are a bit washed out. 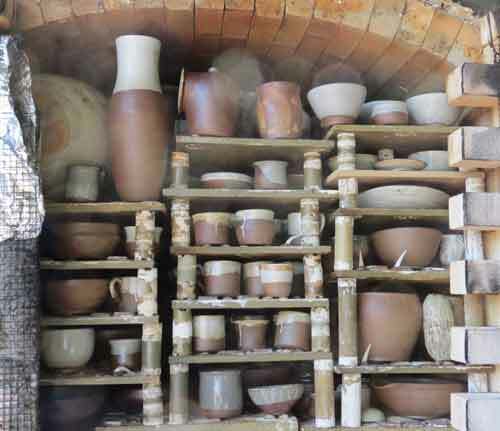 Close up of the upper portion of the kiln. Steve - happy with his offerings, mainly from the rear section close to the flames. 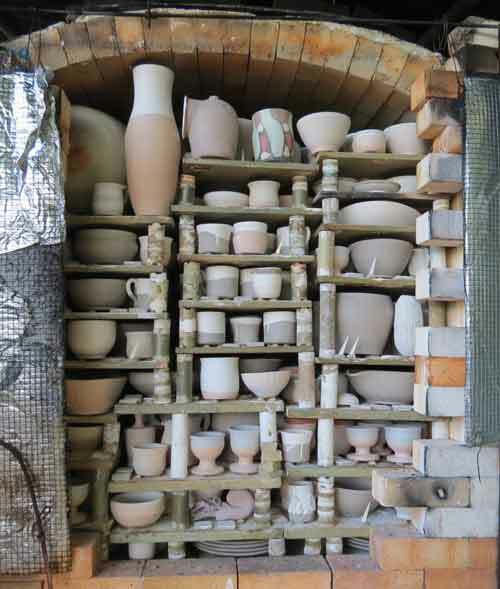 The back of the kiln revealed when the front section has been unloaded. Close up of the back upper section. 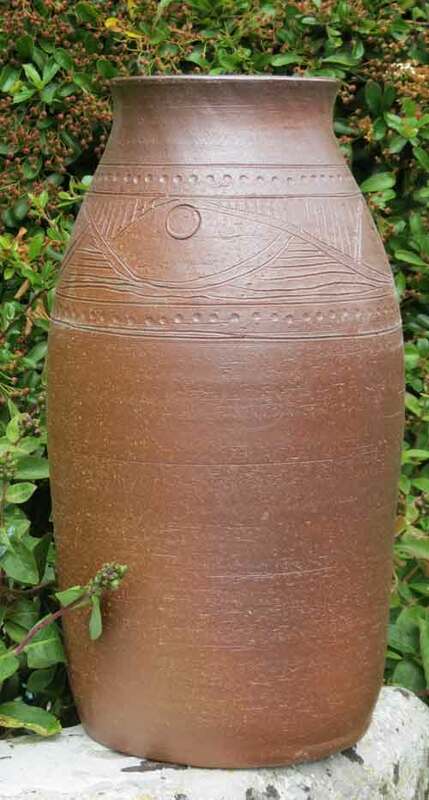 With some of Steve's pots removed impatiently! 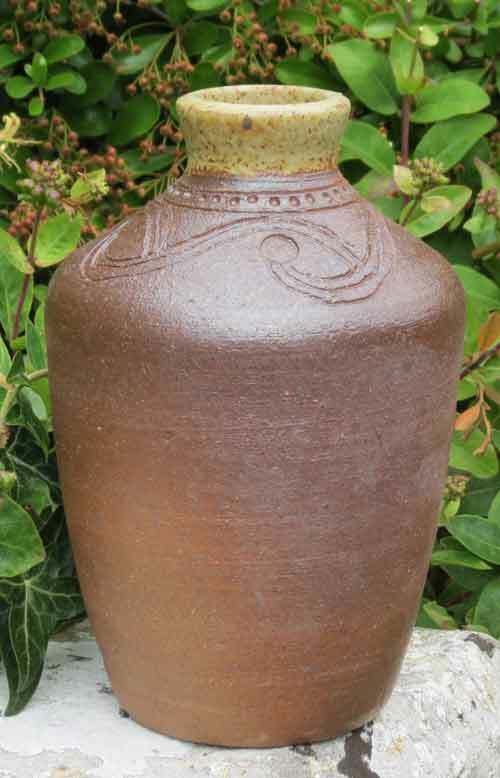 Good results, with a good sheen from the ash reacting with the clay. All gone! 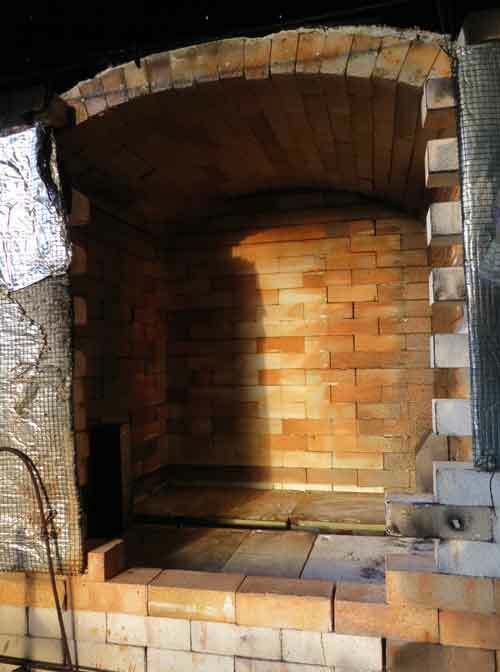 The empty kiln chamber. 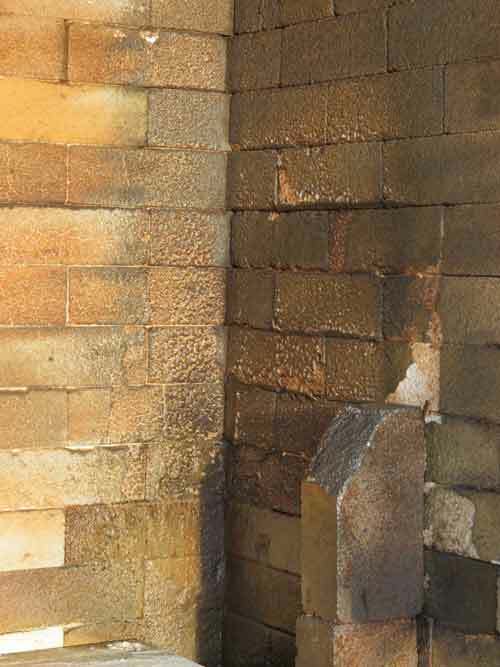 A close up of the corner of the kiln chamber, showing how the flames and ash are gradually eating away the surface of the bricks, coating them with glaze-like layer, which then peels away - but that falls into the fire box rather than onto the pottery. 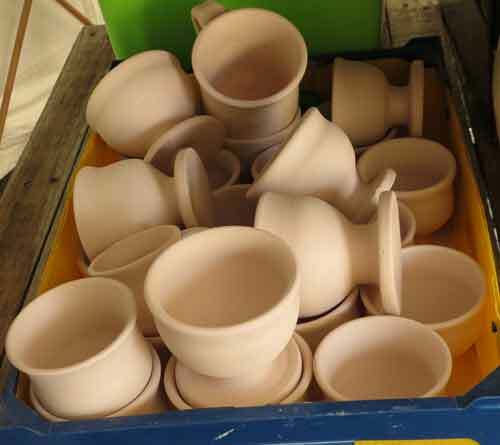 A collection of some of the class pottery. 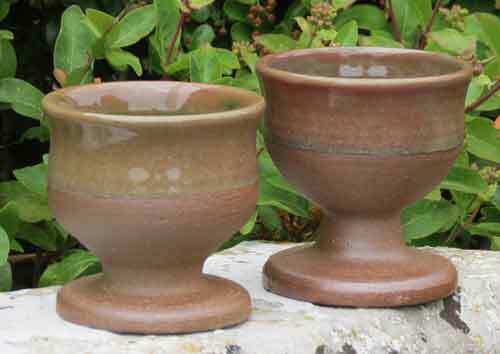 Bill's batch of goblets, showing how the copper oxide rich transparent glaze changes from oxidised green to reduced red and iron oxide brown stays brown! 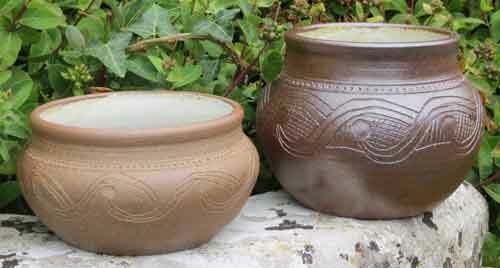 Bill's bowls inspired by Iron Age Glastonbury Ware, originally found in the lake villages of the Somerset Levels. 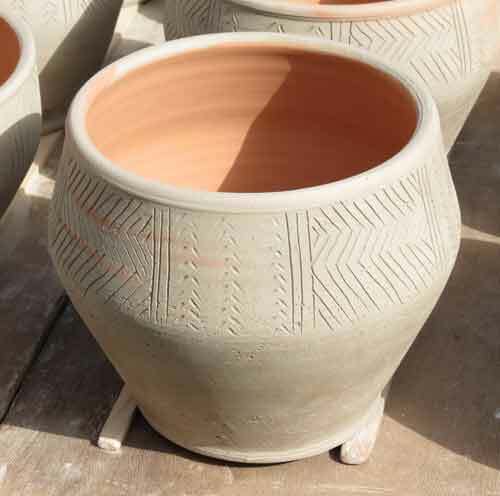 Bill is still learning how the cut the curved patterns on these bowls, having spent years only doing straight lines for Bronze Age and Neolthic replicas! 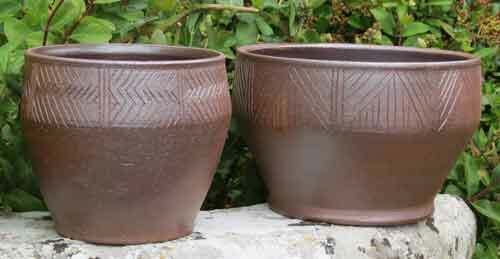 These bowls have been made for an exhibition at White Stones Gallery on Portland. 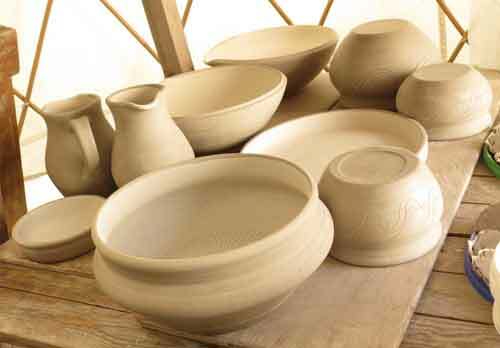 More Glastonbury Ware inspirations. 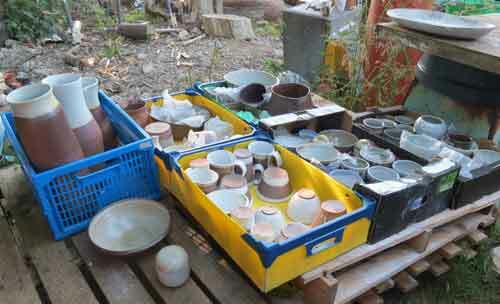 These were part of the payment of rent for the kiln site! 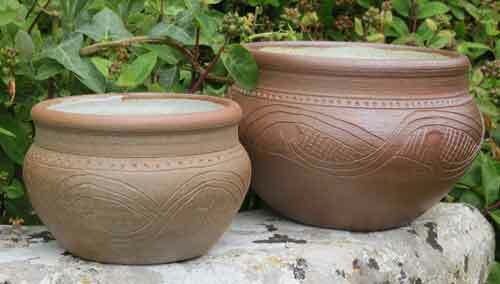 Pots following the style of Grooved Ware buckets, from the Neolithic Orkney Isles and across Britain. 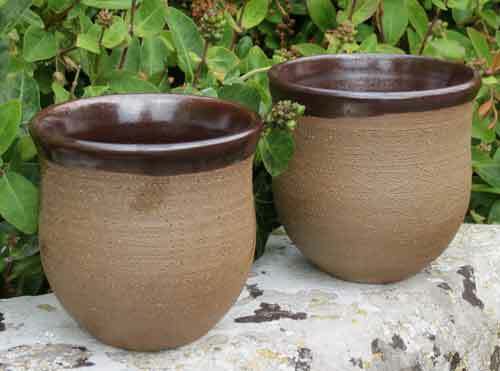 Beakers - Bill's favourite drinking vessels! 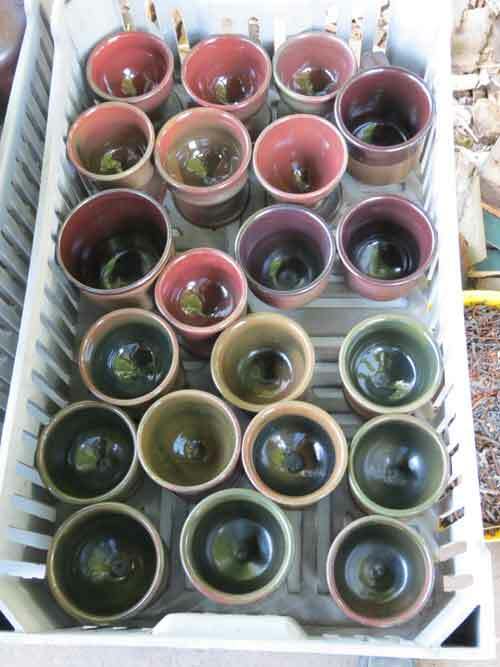 Goblets from the reduced areas of the kiln. 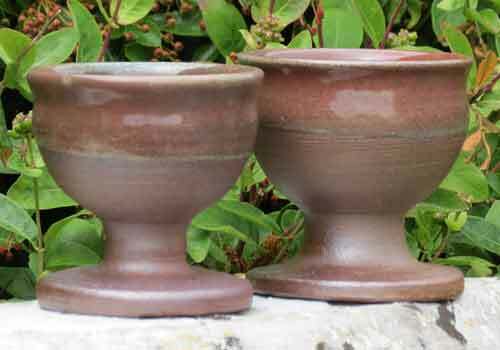 Goblets from the oxidised parts. 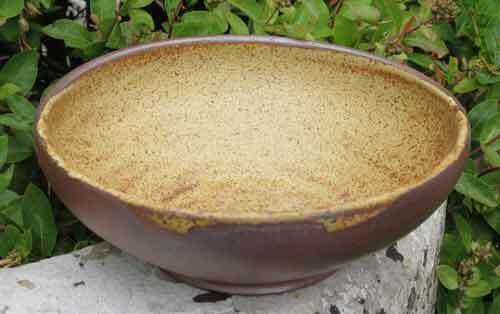 One of several "Mortarium" lipped bowls. 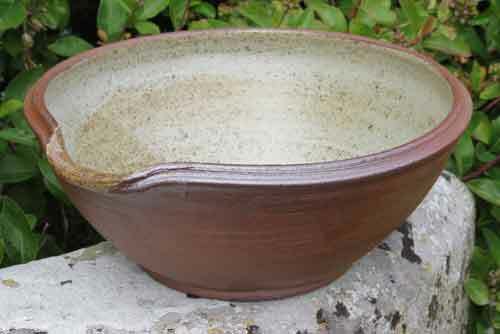 Bowl glazed with wood ash recipe - not really quite hot enough to run like it should. 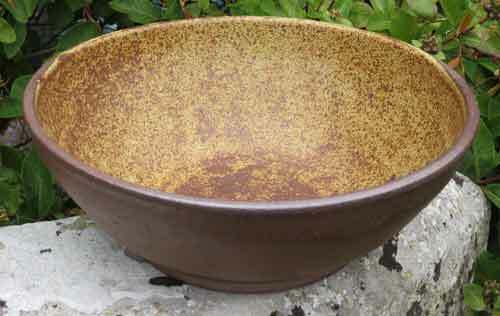 Another wood ash glazed bowl. 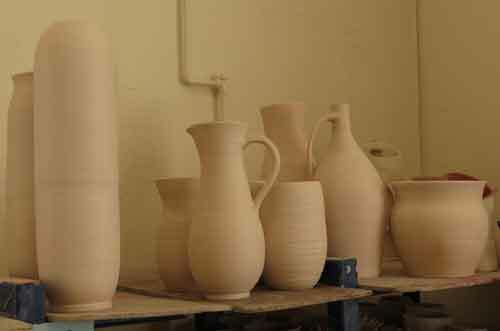 A reasonable firing, lovely weather! Not as much ash speckling as usual, and slightly cooler all over. 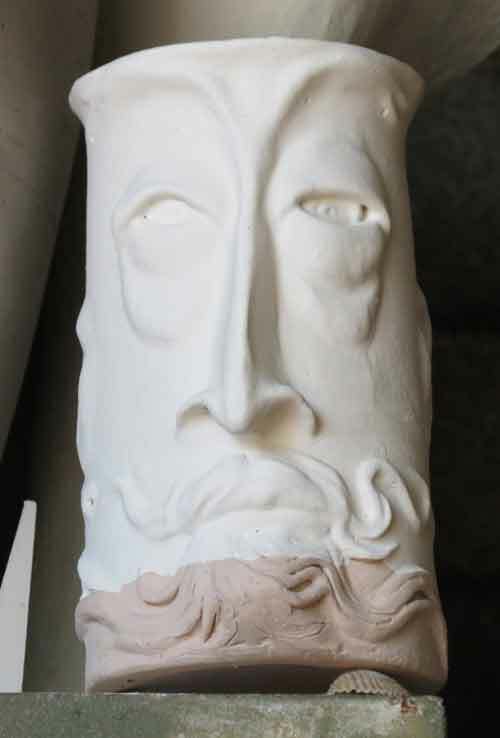 But better than hoped for immediately after the late night end of firing. Very happy potters from the class and fellow local potters. Kate V for her felled nicely seasoned logs. 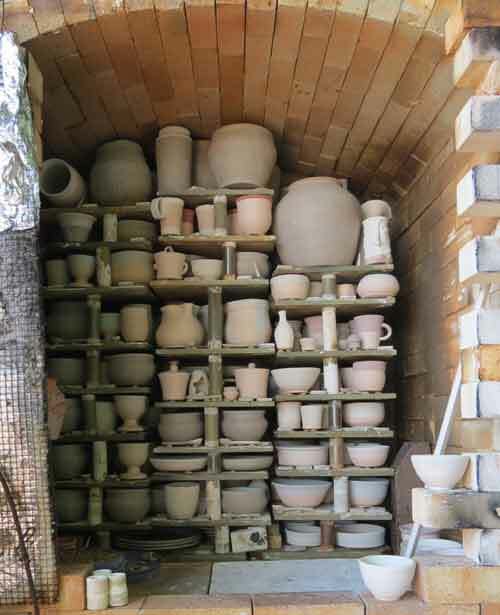 Pottery Class members and other potters for help filling the kiln and then firing and unloading it, especially Steve, Dale, Jennie, Sharon and Richard.